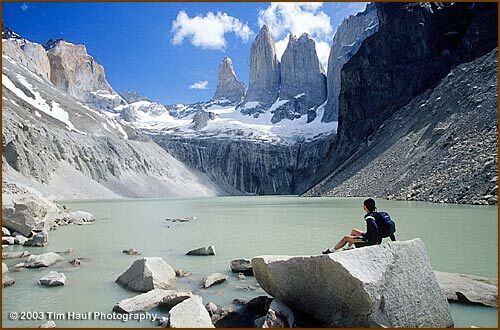 "The Best Value in Patagonia Hiking!" Jan. 4 - Jan. 19, 2019, Miami departure ONLY. Jan. 18 - Feb. 2, 2019, LAX departure ONLY. Contact us about flights if you are overseas. 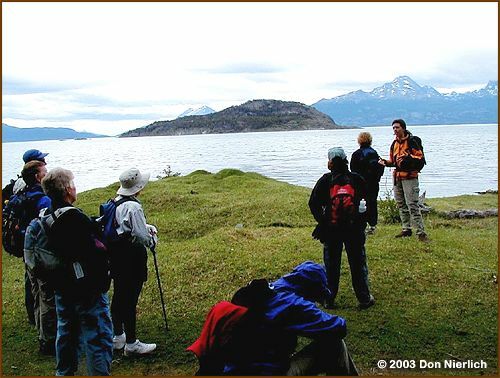 Reserve your Patagonia Adventure Today! All-inclusive prices include international flights from Miami (Jan. 4 Departure) or Los Angeles (Jan. 18 Departure) and ALL flights in Patagonia, ground transportation in Chile and Argentina; hotels, shelters; and all meals. 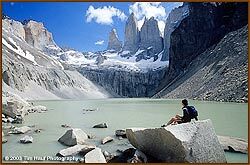 The best value in Patagonia adventure travel. Before making your reservations with another company download and print our What's Included Checklist and compare! This will be our LAST Patagonia Hiking Adventure season. Early morning arrival in Santiago, where you will be met by your trip leader outside the customs area at the Santiago airport and continue on our flight to Puerto Natales, situated on the shores of Seno Ultima Esperanza (Last Hope Sound, S 51.7°, W 72.5°). We drive to Torres del Paine National Park. We will see large herds of sheep and baqueanos (cowboys). 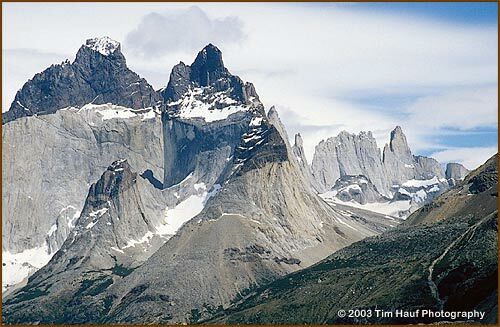 As we approach the park along Laguna Amarga, we will have our first views of the spectacular granite Towers of Paine. It is likely we will also enjoy sightings of herds of guanacos, condors, flocks of pink flamingos, a variety of foxes, geese, ñandus (wild ostriches) and other wildlife. After entering the park, we get settled at Hotel Las Torres. Limited spaces at Hotel Las Torres. We have additional accommodations at Refugio Las Torres. Today's hike: Optional short distances to loosen your legs around the hotel in Torres del Paine. Driving distance: 2 ½ hours. About 75 miles . After reviewing the day's route with our guide, we hike up the Ascencio Valley. We cross the river and continue uphill along a lenga and cypress trail. As we pass by campamento Chileno and the foot of Mt. 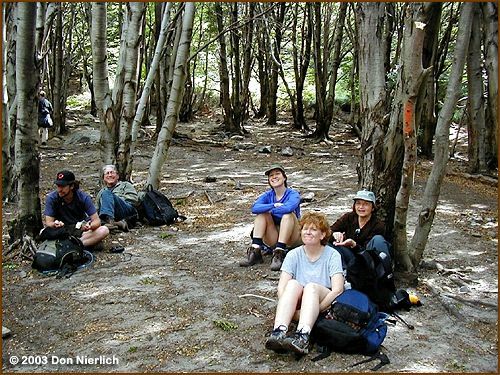 Almirante Nieto, the trail follows a southern beech forest, finally reaching a moraine that takes us to the cirque below the famous Towers of Paine; Torre Sur (9,350’), Torre Central (9,186’) and Torre Norte (8,530’). Downhill back to the hotel. Overnight at Hotel Las Torres. Today's hike: 12.5 miles or about 6 to 8 hours, including the out-and-back hike to the towers. A shorter hike is optional. This morning we explore our surroundings and hike along the north shore of Lago Nordenskjold following the “W” circuit of the Park. Overnight at refugio Cuernos. Today's hike: 8 miles or about 5 hours. We hike west of Lago Scottsberg and follow a trail along rolling foothills arriving at the Italian camp. You will have views of the enormous horns Cuernos del Paine (7,217’, 7,874’ and 8,530’) on the east and the glaciated Cerro Paine Grande (10,006’) on the west, as well as Lago Nordenskjold and Lago Pehoé. Overnight at Paine Grande Mountain Lodge on the shore of Pehoé Lake. Elevation: About 270'. Today's hike: 8 miles or about 4 hours. 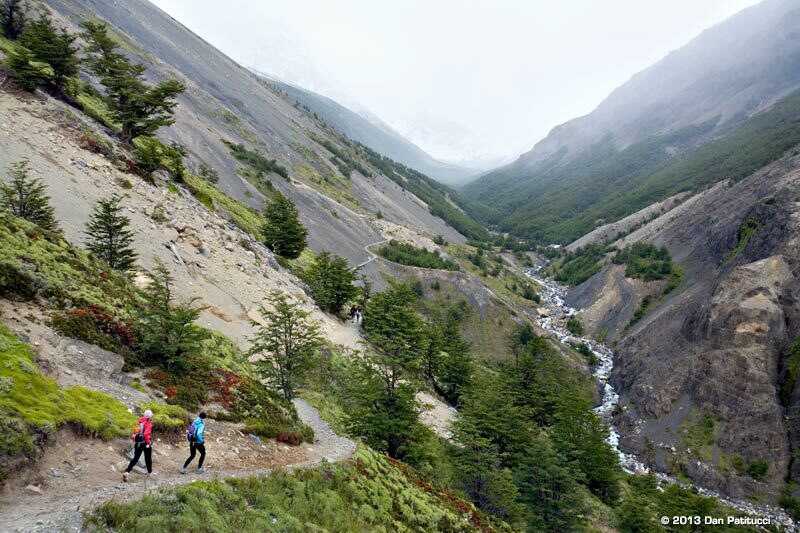 An optional out-and-back hike up the French valley, offers beautiful vistas of the Cuernos del Paine. We hike toward Lago Grey and Glacier Grey - a 4 mile wide glacier originating in the Continental Ice Cap. As we hike along Lago Grey, we will see turquoise-colored icebergs blown to the opposite side of the lake by the strong winds. We hike to Grey glacier and return late in the afternoon. 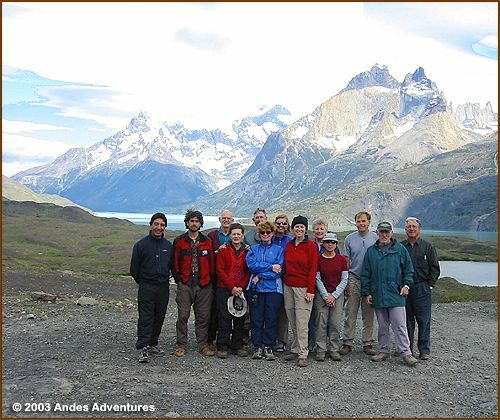 The hiking group overnights at Paine Grande Mountain Lodge on the shore of Pehoé Lake. Today's hike: About 12 miles or 6 to 7 hours. A shorter hike is optional. We take a catamaran across Lago Pehoé and arrive at Refugio Pudeto where our vehicle is waiting for us. (Depending on wind conditions we may hike to the park headquarters). As we drive to the park entrance, we enjoy the best views of Lago Pehoé, Lago Nordenskjold and Lago Sarmiento as well as the Horns and Towers. We cross the Argentine border and arrive in the village of El Calafate on the shore of Lago Argentino. This is a long day of driving (about 5 1/2 hours), partly over dirt roads across the pampas, but the majority on asphalt road. There is always something to see along the way. 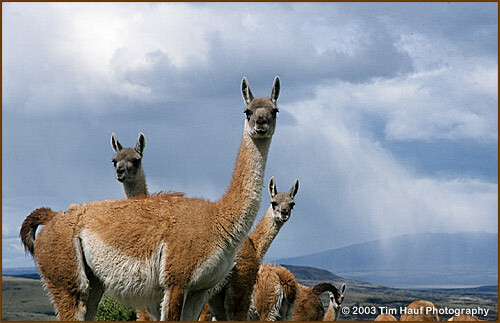 Grazing sheep, wildlife and the unusual open range Patagonian steppes scenery. We drive along Lago Argentino to the spectacular Perito Moreno Glacier  the world’s only glacier outside the polar region that is still advancing. Afterward we continue our drive north crossing Río (river) Santa Cruz and along Río La Leona to the shores of Lago Viedma till we reach the village of El Chaltén at 800 feet. As we approach El Chaltén we can see our first view of Mount Fitz Roy (11,171’) and Cerro Torre (10,177’). Overnight in El Chaltén. Today's hike: Short hike in Perito Moreno. We drive to north side of the park and hike through a beech and lenga forest. 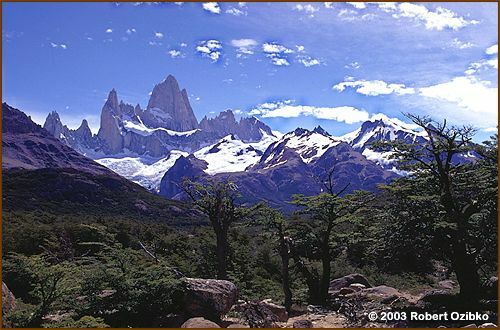 We have views of Piedras Blancas Glacier and Mount Fitz Roy. We cross the Poincenot camp and reach the basecamp of Río Blanco. 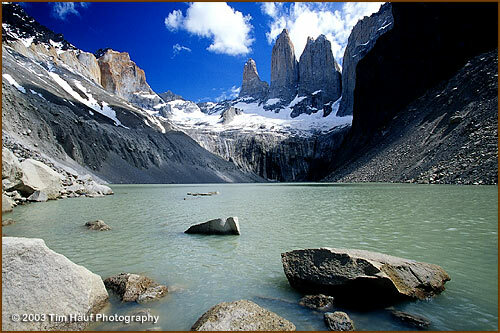 You can continue on the optional hike to Laguna de los Tres, from where you will have outstanding views of Fitz Roy, the adjacent Poincenot neddle (9,849’), Rafael, Saint Exupery and other granite spires. Optional visit to Laguna Capri on your way down. Overnight in El Chaltén. Today's hike: About 8 miles or 6 hours, plus an optional out-and-back hike up to Laguna de los Tres. This morning we hike to Laguna Torre at 2,164’ at the base of Cerro Torre (you have the option to admire the view from the Fitz Roy valley). Cerro Torre (10,177’) is one of the most difficult mountains in the world to climb, because of its vertical walls topped by an overhanging mushrooms of ice. With some luck Patagonia’s unpredictable weather will cooperate and it will be clear enough to see Cerro Torre. Note that the height of the vertical east granite face of Cerro Torre is about 4,000 feet – nearly 1000 feet taller than Yosemite’s El Capitan. The hike continues through Laguna Madre e Hija and descends to El Chaltén. Overnight in our familiar lodge. Today's hike: About 9 miles or 6 hours. You also have the option to make your hike shorter or longer. 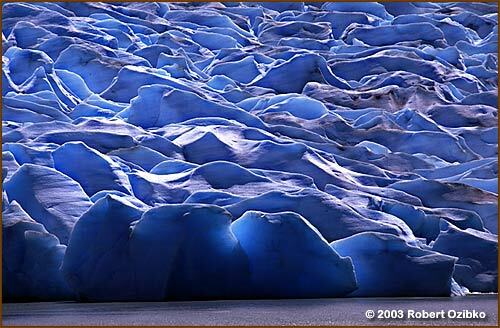 We drive to El Calafate and fly to Ushuaia the “Southernmost City in the World” on the island of Tierra del Fuego. After lunch we board a boat or catamaran for a 3 hour cruise along the Beagle Channel. We cruise south to Isla de Los Pájaros (Birds' Island) and Isla de los Lobos (Sea Lion Island) where you can observe the Sea Lions and Imperial Cormorants. You will also see brown hooded Gulls, South American Terns, Black-browed Albatross, Giant Petrels, Great Skuas and other marine wildlife. After circling the Eclaireurs Light House, we return to Ushuaia sailing along the northern shore of the channel. Overnight: Hotel Tierra del Fuego. Driving time: About 3 1/2 hours. After breakfast we drive to Tierra del Fuego National Park west of Ushuaia. We start our hike at the Pampa Alta Trail. Our guide will lead us through lovely sub-Antarctic forests of beech, ñire, lenga, coihue and an abundance of moss and ferns. After reaching the top (about 1,000’) we enjoy a panoramic view of the Beagle Channel, Isla Redonda and Ensenada Bay. We descend and connect with Sendero de La Costa (Coastal Trail) and continue along the rocky shores of the bay finishing at Roca Lake. After lunch we visit Bahia Lapataia. The park offers great opportunities for bird-watching. Some of the species that you will see are the Black-browed Albatross, Giant Petrels, Steamer Ducks, Magellanic Woodpecker, Thorn-tailed Rayadito, Chimango Caracaras, Black-Chested Buzzard Eagles and others. Overnight in Ushuaia. Today's hike: 5 miles with options for more or less. Morning flight to Buenos Aires, Argentina’s cosmopolitan capital. We arrive at Aeroparque Jorge Newberry Airport and transfer to our centrally located hotel, a few blocks from the city’s landmark, the Obelisco. Time on your own for sightseeing. We start our tour of Buenos Aires from the hotel. This tour shows you the city’s highlights, looking through its history and culture, the historic development, the immigration process, the architectural heritage, Peronismo era and other features of the Argentinean society. You’ll learn about cultural topics like tango music and soccer. Starting from Plaza de Mayo we will enjoy a tour of the most remarkable highlights of this unique metropolis. Our itinerary will focus on the main places of interest of the southern and northern region of Buenos Aires: major plazas, colonial churches, old-time cafes, bohemian artist's quarter, colorfully painted metal houses, grand avenues, palatial mansions and spacious parks. We arrive in the neighborhood of San Telmo and complete our tour by bus, visiting the neighborhoods of La Boca, Puerto Madero, Palermo and Recoleta. Optional tango show and dinner. See note below. *A popular tango show and dinner is offered at a special discounted price, otherwise dinner is on your own and not included. Free day to enjoy Buenos Aires on your own. Afternoon transfer to the Ezeiza International Airport for our evening flight home. 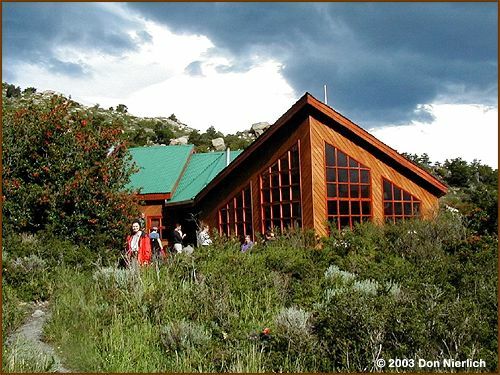  Weather in this region is wildly unpredictable and changeable and itinerary is subject to change due to circumstances beyond our control including weather, road or trail conditions and flight schedules. • On some days we will be driving on dirt roads. 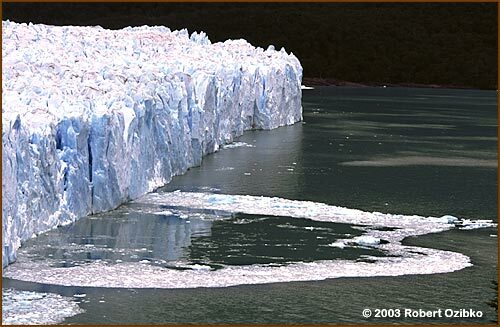 • Due to the very short season in Patagonia, it is very difficult to get flight reservations on short notice. You must make your trip reservation in advance in order to assure space on the trip. 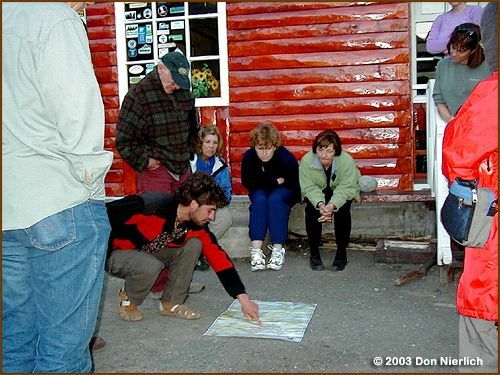 Note: Does not include single rooms at Refugio Torres, Refugio Cuernos and Refugio Paine Grande. • Airline tickets; international and domestic (with all-inclusive packages)..
• Airport Taxes; international and domestic. (with all-inclusive packages). • Airport check-in and baggage assistance in Chile & Argentina. • All ground transportation in large, comfortable 46 seat private buses. • All accommodations in Patagonia: Punta Arenas, Puerto Natales (10 day), El Calafate, El Chalten (Parque Los Glaciares), Ushuaia and Buenos Aires are in fine hotels. Rooms are shared by two people unless a single supplement is purchased. 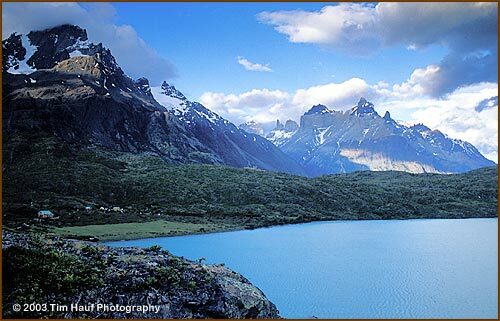 In Torres del Paine National Park we stay the first 2 nights at Hotel Las Torres (the best accommodation inside the park). The other 3 nights we stay in comfortable mountain lodges (the only lodges inside the park) with the option to upgrade to private cabana in Cuernos. Rooms and bathrooms in the lodges are shared among the group, and men and women may be accommodated in separate rooms some nights. Hot showers are available all day long. There is no camping – we spend all nights indoors. 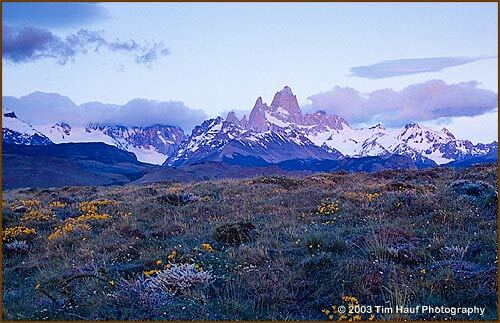 Options for private rooms in Torres del Paine National Park are subject to availability. Inquire and reserve early! • Travel insurance, passport fees, excess baggage fees, Argentine reciprocity fee*, optional tipping to leader, guides and local staff. All items of personal nature such as: personal gear, laundry, telephone calls, beverages, bottled water, etc. *U.S. citizens NO longer have to pay the Argentina Reciprocity of $160. 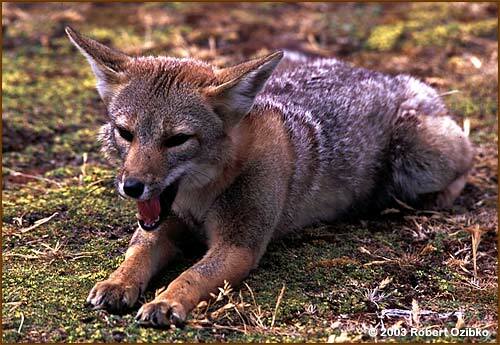 Argentina requires the payment of a reciprocity fee from Canadians US$75 and Australians US$100. This reciprocity has to be paid before your trip. We will send you detailed information about how to pay the reciprocity online. U.S. citizens no longer have to pay a reciprocity fee to enter Chile. Please note that Canadians pay $132, Australians pay US$95, and Mexicans pay US$23 upon landing at the Santiago international airport.